Despite heavy initial demand, which knocked out the US Mint’s website and strong opening day sales of about 20,000, the 2010-P Hot Springs Five Ounce Silver Uncirculated Coins have still not sold out. Michael White of the United States Mint Office of Public Affairs provided updated sales figures for the product, indicating that sales were at approximately 25,000 out of the 27,000 total mintage. The Hot Springs Five Ounce Silver Uncirculated coins feature a portrait of George Washington on the obverse, designed by John Flanagan. The reverse features the facade of the Hot Springs National Park headquarters building with a fountain in the foreground. This is the same design that was used on the circulating quarter dollar and the previously released five ounce bullion version of the coin. The numismatic coins carry the “P” mint mark for Philadelphia and have an uncirculated finish. 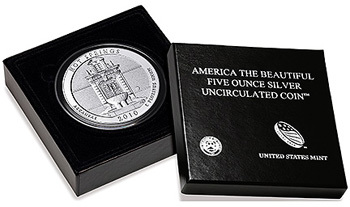 Each coin contains 5 troy ounces of .999 fine silver and has a diameter of 3 inches. Anticipation for the product was high leading up to the release. Shortly before the US Mint began public sales on April 28, 2011, one major coin dealer indicated that they needed several hundred coins. Because their own orders would be limited by the US Mint’s one per household ordering limit, they offered $330 each (plus $25 to cover shipping costs) for the first 400 people willing to commit to resell their coins.